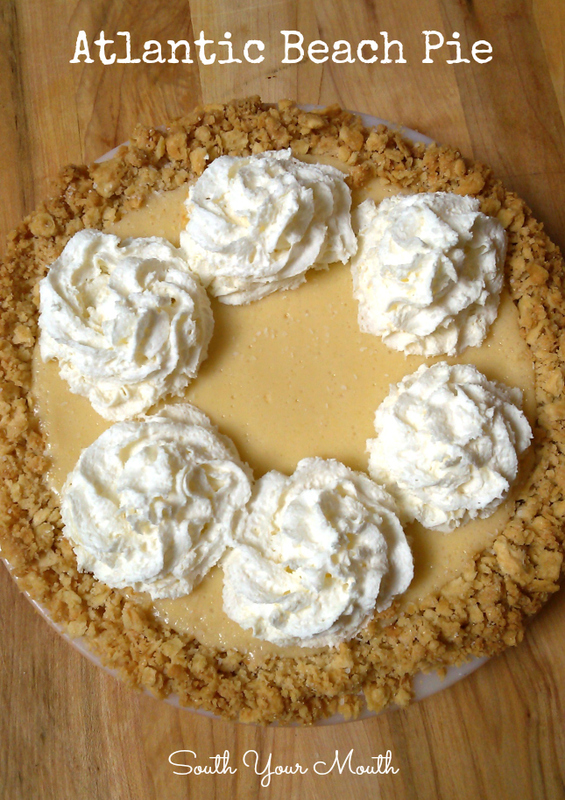 A creamy, tart lemon pie in a saltine crust topped with whipped cream or meringue sprinkled with sea salt. I think I have pie lust. Or had it. No, that’s not right because I’m still lusting over it so... yep, I have pie lust. I’m a big nerd. I read every chance I get. When I’m goofing off online, it’s usually on a news or culinary technique site. And I listen to NPR every time I’m alone in the car. So when I came across an article on NPR’s website about this pie it was a double-whammy. Two of my favorite things in one… a nerdy website and a beautiful pie! Oh, hello, beautiful! I’d never heard of it but evidently, Atlantic Beach Pie is a North Carolina coast specialty. And just the thought of it had my mouth watering. 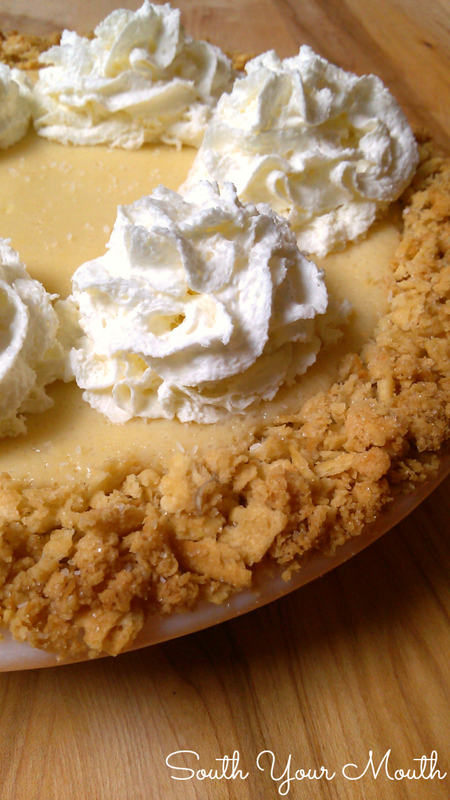 A creamy, tart lemon filling in a crunchy, thick saltine cracker crust topped with whipped cream and sea salt? Shut up! Is your mouth not watering right now? Once I put the crust together I didn't think it would ever fit in a little 8-inch pie plate. I thought surely that was a mistake. But I kept smooshing and mashing and, sure enough, it fit. And I wanted to add more butter because it’s awfully crumbly but I was already at the max end of the butter range (recipe reads 1/3 to 1/2 cup and I used 1/2 cup) so I didn't. Don’t tell anybody but as I was making this pie I was calling it ‘effin crumbs everywhere’ pie because… well, you’ll see when you make it. And then I thought it would be too much crust – that the filling wouldn't stand up to it. Wrong. I was wrong. Again. It’s perfect. It’s the perfect sturdy, crunchy, salty balance to the sweet, tangy, creamy filling. I have a feeling the original pie had meringue on it. Because let me tell you something about Southerners… we ain't wasting nothing. If a pie has four egg yolks in it, that sucker’s going to get topped with meringue. I was going to make meringue (as a matter of fact, those four egg whites are still in my fridge) but I decided to put this together at my in-laws. I didn't want to have to make meringue at their house so I cheated and went with whipped cream. In a can. Don’t judge me! You don’t go around whipping cream or meringue at other people’s houses either. Side note on canned whipped cream: did you know they actually have real whipped cream in cans now? I had no idea! I’d never bought the canned stuff so I was scoping the selection and they had one that was REAL whipping cream in a can. It’s the little things that make me happy, folks. The little things. This pie is like a taste of the beach. Seriously. If you could put salt and sun and sand in a pie, it would taste like this. My only regret is that I didn't make two! In a large bowl, crush crackers with your hands just until all crumbs are pea-sized or smaller (you want a chunky meal, not a fine crumb). Add sugar and butter and knead with your hands until crumbs begin to stick together. Things will be crumbly. It’s OK.
Press crust on the bottom, up the sides and onto the rim of an 8-inch pie plate. Carefully place the crust in the refrigerator and chill for 15 minutes then immediately bake at 350 degrees for 15 minutes. Remove crust from oven. Once the crust is out of the oven, make the filling (not sooner as it will begin to set once you mix it up). To make the filling, combine egg yolks, sweetened condensed milk and lemon juice and mix until well combined and smooth. You can do this by hand with a large whisk or use an electric mixer on medium speed. Don’t mix more than two minutes total or the filling will be too thick to pour. Spread filling into crust (crust does not have to be cooled) then bake at 350 degrees for 15-17 minutes or until set. Cool for 30 minutes at room temperature then refrigerate for 4-6 hours or until pie is completely cold. Serve with whipped cream sprinkled with coarse-grain sea salt. If you’d like to use meringue instead of whipped cream, top filling with meringue before baking then sprinkle with sea salt when serving. Beat egg whites and cream of tartar on medium-high speed with an electric mixer (whisk attachment preferred) for 1-2 minutes or until soft peaks form. Gradually beat in sugar, 1/2 tablespoon at a time, until stiff glossy peaks form and sugar is dissolved. Spoon meringue onto filling and spread to edge of crust to seal well and prevent meringue from shrinking. Bake at 350 degrees for 15-17 minutes or until meringue is set and peaks are golden brown. Cool for 30 minutes at room temperature then refrigerate for 4-6 hours or until pie is completely cold. Sprinkle with coarse-grain sea salt to serve. Mandy - Did you use a deep dish pie plate? Mandy - That looks soooo good!! My mouth is watering as I'm typing - must try soon!! TY! Thanks for finding this recipe. I was lucky enough to eat at a restaurant on Atlantic Beach on stilts over the ocean before a hurricane, I think Floyd, wiped it out. I rarely eat dessert but I had this pie and it did make the meal. Mandy, this is how I make my lemon pie as well as my key lime pies except I use Ritz crackers instead of saltines. Love the salty/sweet thing! Add the extra whites to scrambled eggs. Meringue is disgusting. Meringue is wonderful! Hint: Lemon Meringue Pie?! I'm from Beaufort, NC, right across a couple of bridges from Atlantic Beach. I've always made this pie and never even knew there was anything special about it! I also make mine with a sleeve of Ritz crackers and always with meringue. Delicious. Interesting - bar the salt and the salty crust, this is exactly how I make my lemon meringue pie (with meringue of course!). I vacation right near Atlantic Beach every year and have never even herd of this, I am definitely going to seek it out next time I'm there. Thanks for the recipe. I made this the other day and my husband loved it. I have more recipes from your site bookmarked than I do from any other -- look forward to making them all! Mama Mia! This sounds amazing! Gotta put this on my "to-do" list!!! This is called a "Down East Lemon Pie" when you use buttered crushed Ritz crackers for the crust and meringue on top. (Down East as in East of Atlantic Beach on the NC coast). The buttered Ritz crackers are awesome as a crust. I'm gonna have to try this as one of the desserts for Thanksgiving! I made this last week for a holiday party. OMG it is soooooooooooooooooooo good. I hadn't seen the comments, but I didn't have saltines so used Ritz crackers. Such a delicious crust! I am going to make it again using lime juice instead of lemon because I have a key lime tree (actually a houseplant--in Maryland!!) with about 8 little key limes on it. I know it's going to be the best "key lime pie" EVAH. Thanks, Mandy!